If you read our recent post about how the whole Turnbull Manufacturing / Texas Motor Speedway relationship came to be, then you also know that I am a Tony Stewart fan. I love NASCAR, and would have been happy to present the pole trophy to any driver, but to have the honor to presenting to Tony was just awesome. 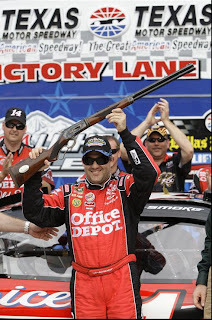 This photo of Tony holding the Turnbull rifle is from an article in USA Today about Tony’s first pole in 5 years. We’ve met some amazing folks this weekend from Governor Perry to Jeff Gordon and several in between. We look forward to share more in the coming week as we get back from Texas. As for now, we’re waiting on the rain to lift and the track to dry so racing can get underway. It’s been a great couple of days – and it looks like our stay may get extended a day or so if the race is postponed until tomorrow. Stay tuned for more great stories and photos from Texas and Turnbull Manufacturing.